We went through just after this truck…. It was sunny today when we woke up, so we got going early(ish) and stopped along the way for breakfast, and then stopped again for coffee. We were making good progress so decided to detour past Poas volcano. To be honest, I wasn’t that hopeful… every other lookout we’ve stopped at in Central America has essentially been fogged out. As in all that we see is a sea of white, like we’re wearing goggles that have been covered with shaving cream. Before that though, we had the hairiest riding experience of the trip so far. We’d been riding along quite happily for a while, past coffee plantations, on a smoothly tarred and curvy – albeit somewhat narrow – road. All of a sudden, we were stopped by red and yellow tape across the road… think a roadworks version of police tape… and a bunch of guys sitting around roadwork machines, not seeming to be doing all that much. We thought that road was closed and so were all set to turn around, but a guy unrolled the tape and waved us through, saying that a bridge had washed away but we’d be able to go around it and yup, on a motorbike was fine. Ha. What he meant was that a rather large waterfall had washed away the bridge and part of the road, and had since effectively become the road, and that by riding ‘around’ it he meant riding ‘through’ it. The picture of the waterfall doesn’t really do it justice. The water was flowing very fast, and the pool was deep… with my feet on the pillion pegs, I had water up to my ankles at one stage… so I’d say it was at least 30cm, and rocky. And loud! On our right was the waterfall coming down the cliff face; on our left was the cliff going down into the valley. In between, the water was flowing quickly through the pool I mentioned. Suffice to say that when I first saw it, I thought ‘oh deary me, I’m not sure about this’ (or words to that effect). One of the workmen (part of a second group who were standing around near the waterfall, also not working) got out his phone to take a picture of us going across – and actually fist pumped us after we safely made it. So even though beforehand he seemed to be gesturing casually ‘yeah yeah you’ll be fine,’ clearly he was pleased/surprised. As was I!!! Anyway, we made it to the volcano, paid our $20 USD entry fee and saw… a total white out. Oh well. At least it was an interesting ride to get there! And on the way to our destination for the night, we experienced a new trip record for cheapest road toll: 10c!! Seriously… you have to wonder whether it is really worth the cost of the infrastructure and staff when it’s only 10c a pop. It took us a while to find accommodation for the night, with our two initial destinations being, well, undesirable… but we got there in the end (albeit after dark…breaking that golden rule for the second time this trip…). 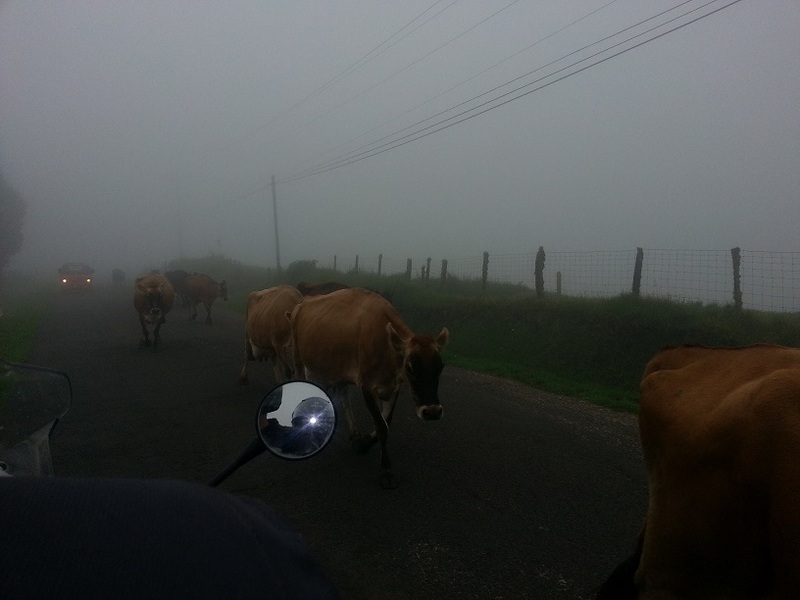 Another example of some of the riding conditions… and this was taken in the middle of the day!! It was absolutely pouring when we woke up this morning, which was unusual… it does rain here quite a lot at this time of year; usually it happens in the afternoon and the mornings are sunny (or if not sunny, at least dry!). Psychologically, there’s something much less enjoyable about setting out to ride in the rain than if it happens to start raining when you’re already on the road. When the latter occurs, it’s no big deal – we just stop and put our wet weather gear on. But the idea of starting in a torrential downpour… it’s just depressing. So – we didn’t! Instead, we lounged around our rainforest retreat, reading books etc and listening to the rain on the roof and the parrots outside. It was lovely! 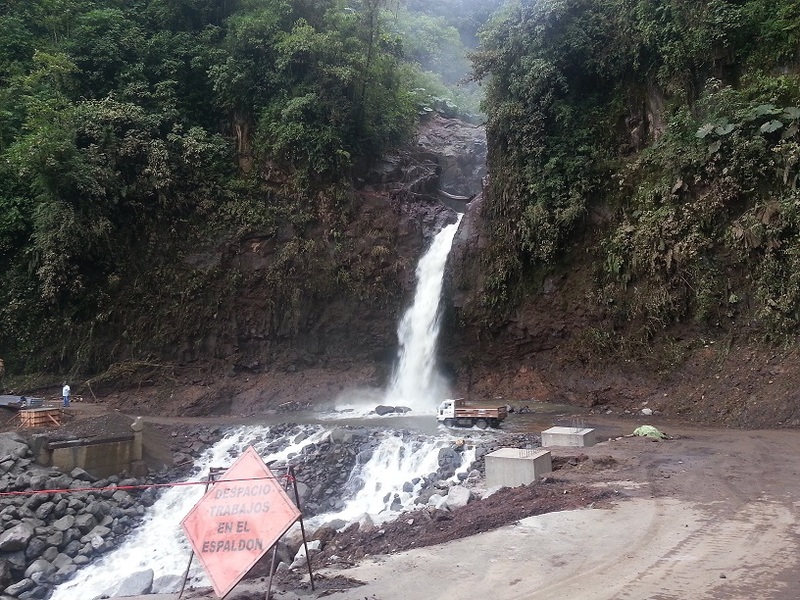 This entry was posted in Costa Rica and tagged fog, rain, waterfall. Bookmark the permalink. Oh deary me! Did you notice if any of the workmen had their phones out – filming for world’s scariest videos?